We are delighted to announce that Gortnor Abbey Transition Year students will perform some songs, dance routines and acting from their recent sell out musical All Shook Up at Crossmolina Day Centre on Wednesday 17th May at 12.30pm. You are invited to come along and sing along to all your favourite Elvis songs. Light refreshments served after. There is a charge of €5. Community Bus is available to pick up those that need transport. Please call 096 30935 for further details. The death occurred peacefully on Thursday 27th April of Patrick (Pat) O’Malley Church Rd Crossmolina. His remains reposed at Hiney’s Funeral Home on Saturday evening with removal to St Tiernans church burial on Sunday in Crossmolina Cemetery after requiem Mass. Pat was pre-deceased by his wife Bridie is survived by his daughters Mary T, Bernadette, Joan, Aedamair and Anne, sister Joan, sisters-in-law, grandchildren, Kate, Sarah and Emma, sons-in-law, nephews, nieces relatives , friends and neighbours. May he Rest in peace. 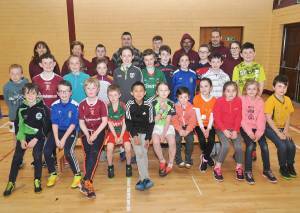 Crossmolina National Schools girls team suffered defeat at home to Belmullet in Cumann Na mBunscoil last Tuesday the winner were always in control winning in the by 3 – 5 to 1 – 2 Michael Herr was impartial Referee. 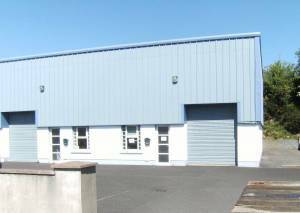 Serviced Industrial UNIT to let 1,250Sq. Foot in Crossmolina Business Park. 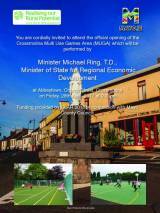 For further information Contact Crossmolina Community Council at (096) 30934 or (087) 9583240. There was no winner of the Crossmolina Deel-Rovers GAA Club Lotto Jackpot on Saturday night 22nd April. The numbers were 4 – 20 – 24 – 32 one punter matched three numbers James Munnelly Chapel View Crossmolina he won €150. The draw took place in Christy’s. This weeks Jackpot is €4, 050. Many thanks for all your support. Sympathy is extended to the families of Willie Costello Cong brother – in – law of Mary Costello Ballina Rd and Celia Mylynckj Nee Davitt sister – in – law of Matt Kilroy Keenaghbeg who died recently. May they rest in peace. The next heat of the Singing Pubs takes place in Hiney's on Sat. May 6th, music by Irishize, if you would like to take part please call 087 3162376, €100 prize on the night, overall prize €1000. Plans are well underway for Festival 2017 and Crossmolina Festival in conjunction with the Ballina Manor Hotel are pleased to announce International recording artist Sharon Shannon And Her Band in concert as part of this year's festival as part of Sharon's Summer Tour. Sharon has previously toured with Bono, Shane McGowan, Willie Nelson, The Waterboys and many more. Tickets will be on sale locally and online from Fri. May 12th. Thank you to all that supported the opening Day of the Crossmolina Day Centre on Tuesday 25th April in Crossmolina Social services. Over 70 people attended and enjoyed music provided by John Cosgrove, Mick Shannon, Padraig Hanahoe, Packie Hefferon, and Sean Gallagher. Singers Fred Finley, Fr Francis Judge, Michael Gallagher, Breege McAndrew, Bridgie Gilroy, recitation/poetry Breda Mulkearns. Michael Loftus, MCC, offered the Day Centre congratulations and best wishes for the future. The Day Centre committee provided tea, coffee & light refreshments, funded by Crossmolina Community Development and Crossmolina Social Services. Transport was provided by the Crossmolina Community Bus. We liked to thank Sr Finola Keavney, Cathal and Carmel Prior for the beautiful floral arrangements. M.C. for the day was Claudette McLoughlin, Crossmolina Community Development Administrator. Also in attendance were Public Health Nurses Paula Duggan, Helen Ruttledge, Patricia Gallagher and Dr Eleanor Fitzgerald. We wish to thank the volunteers who offered their services and contributed to making a very successful and memorable occasion. The day centre will be held monthly and will comprise of bingo, card playing, music & singing sessions, dance, arts & crafts, and cookery demonstrations. U 9 Group A winner: Kayleigh Coggins, r-up: Aaron Keane, U 9 Group B winner: Dylan Keane, r-up: Patrick Leonard. U10 Group A winner: Josh Moyles, r-up: Jack O'Reilly. Aaron Coggins, r-up: Sarah Gough, Group B winner: Ronan Walshe, r-up: Ronan Connor. U13 A winner Diarmuid Coggins, r-up: Jack Loftus, B winner: Matthew Williams, r-up Caolan Foggin. U15 winner Darragh Kelly, r-up Jimmy McAndrew, and in the U17A section winner: Edward Gough, r-up James Gill. U 17 "B" winners: Jimmy McAndrew and joint second on 75 points were Adam Langan and Darragh Kelly. A very lively competition in this section, throwing out some surprises with our new members Jimmy and Adam putting on the pressure!! Heartiest congratulations to everyone and a special thank you to all our coaches, Volunteers and parents without whose assistance we could not continue with such success. A little help can go a long way. And we shall see you all after summer early September God willing. Happy hols to all. Rest relax and recuperate after a very busy Year. The death occurred peacefully on Saturday 15th April of Kathleen Deane nee Gordan late of Kildaree Crossmolina. Her remains reposed at Leonards Funeral home on Sunday evening. With requiem Mass on Monday in the Church of Our Lady Kilmurray burial afterwards in the adjoining cemetery. Kathleen was predeceased by her son John, husband Jack, is sadly missed by her family, relations, friends, and neighbours. May she rest in peace. The death occurred peacefully on Monday 10th April of Patsy Hanrahan nee Kearns Norwood, South London and formerly of Carrowkilleen Crossmolina. Funeral is taking place in Norwood on Thursday 4th May. Patsy was predeceased by her husband Michael, is survived by her sons James, Paul and Noel, daughter Lorraine, daughters – In – law, son – in – law, Grandchildren, sisters Mollie Gallagher Shanvolahan, Kathleen Byrne, Aughrim Co Wicklow, nieces, nephews, extended family, many friends and neighbours, May she rest in peace. Plans are well underway for Festival 2017 and Crossmolina Festival in conjunction with the Ballina Manor Hotel are pleased to announce International recording artist Sharon Shannon And Her Band in concert as part of this year's festival as part of Sharon's Summer Tour. Sharon has previously toured with Bono, Shane McGowan, Willie Nelson, The Waterboys and many more. Tickets will be on sale shortly. Best of luck to the current Nephin Rose, Laura Judge, who is taking part in the Mayo Rose of Tralee Finals next Saturday night. 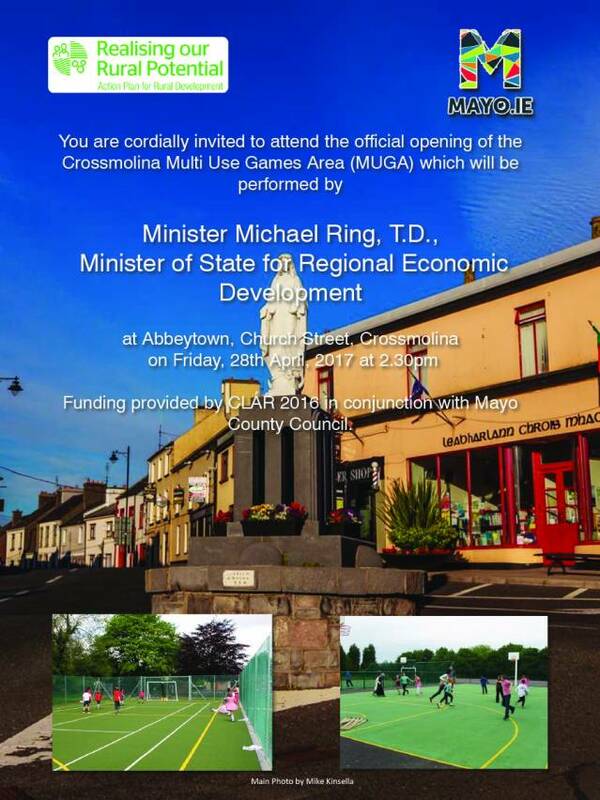 You are cordially invited to attend the official opening of the Crossmolina Multi Use Games Area (MUGA) which will be performed by Minister Michael Ring, T.D., Minister of State for Regional Economic Development at Abbeytown, Church Street, Crossmolina on Friday, 28th April, 2017 at 2.30pm Funding provided by CLÁR 2016 in conjunction with Mayo County Council. To view poster click here. Front Row Left to right; Aaron Coggins, Ronan Walshe, Ronan Connor, Dylan Keane, Michael Lin, Sara Conway, Cian Coggins, Kayleigh Coggins, Roisin Tolan, Isabelle Moyles and Joey Keane. Middle Row Left to right; Jack O'Reilly, Esmond Maughan, Caoimhe Tolan, Ayla O'Malley, Zara Moyles, Josh Moyles, Dylan Rowland, Sarah Gough, James Loftus and Marcus Maughan. Back Row Left to right; Pauline Coggins, Aileen Gough, James Gough, David Collins, Darrragh Kelly, John Valerio, Eva Moyles, Jonathon Verry and Daisy Verry. 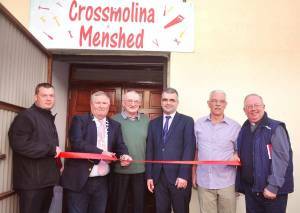 Ballina Municipal District Chairman Councillor Michael Loftus Cutting the tape at the official opening of Crossmolina Mens Shed which is situated beside the car park up the Boreen. Also in the picture are from left to right Lenny Derossa, Martin Mulhern,Dara Calleary ,TD Tommy Gallagher and Fr Francis Judge PP.